A breakdown of the assignment title, due date, student access, and everything else in the assignment settings. 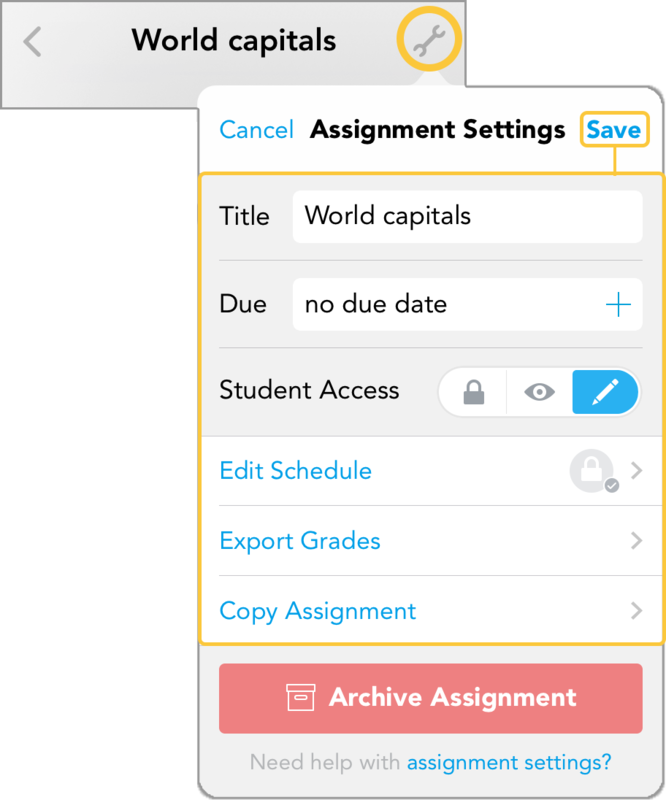 To find the assignment settings, go to the class first, and then the assignment, then tap the wrench icon! You can easily change your assignment title here at anytime! You can even include emojis! Change your due date anytime here! After the date set, the assignment will remain open but it will also let you know if something has been submitted late. Update notifications will show a red clock for late submissions. You can also remove the due date altogether if you'd prefer to keep it open. You can set the assignment to be locked, view-only, or unlocked (editable). When an assignment is locked, students won’t be able to access it. Find out the different types of student access here. Here’s where things get interesting: you can set certain dates to change types of student access by editing the schedule. This way, after a certain date, student access will change so you can easily keep track of due dates. First, you need to add grades! Afterwards, this will allow you to make a quick spreadsheet of your students’ grades. Here’s how you can do that. You can copy an assignment to another class! This can be useful when you want to keep the same materials for a new semester for example. Check out this guide for more! This will remove the assignment from the assignment list. This can clean up your list once it starts to get too long. This won’t delete the assignment so you can come back to it again at another time! Learn more about archiving here.